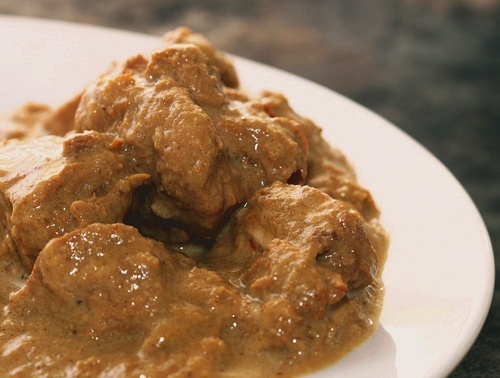 Easy Recipe For Korma Chicken (Ayam Kurma). This dish is very popular in Indian restaurants in Singapore, Central Asia and Western Asia. Why not prepare this special dish for your family for lunch or dinner on Deepavali holiday? Korma can be made with yoghurt, cream, nut and seed pastes or coconut milk; it is usually considered a type of curry. Both vegetarian and non-vegetarian kormas exist. Wash chicken thoroughly under running water. Drain and cut into 6 pcs. Marinate chicken pcs with coriander powder. Leave to stand for 30 mins. In a mortar, pound individually garlic, ginger, jintan manis, white pepper and green chillies till fine. Heat ghee in pan, put cinnamon stick, cloves and pounded ingredients until fragrant. Add in chicken pcs. Cook for 10 mins. Add in 2nd milk and tomatoes. Bring to boil over high flame until chicken is tender. Add in 1st milk and bring to a slow boil. Turn off flame and add in lime juice and salt to taste. love yr site! and finally found a great korma chicken recipe!